Woman using app on smartphone smiling and texting on mobile phone. 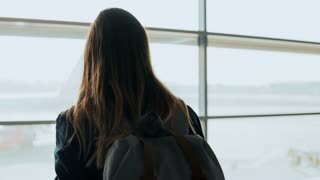 Young girl using smartphone near airport window. Happy European woman with backpack uses mobile app in terminal. 4K. Confident successful Caucasian businessman using smartphone mobile office app while traveling on the train window seat. Tired woman texting on smartphone while lying on a sofa in the living room. Smiling blonde girl reading a message, browsing on internet and using app, having fun conversations chat with her mobile.